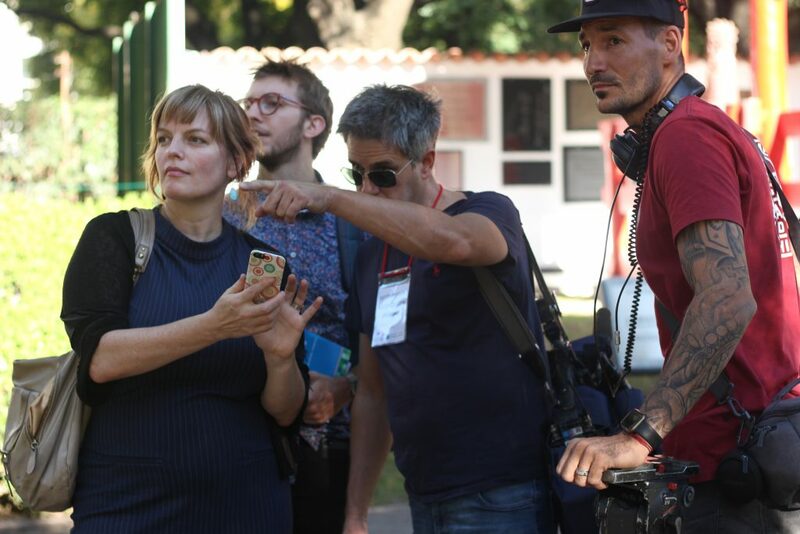 What happens when a national news program in Argentina wants to know about the American woman who married herself in Buenos Aires? That happened this week. The interview was all in Spanish. Oh my god, it was amazing! 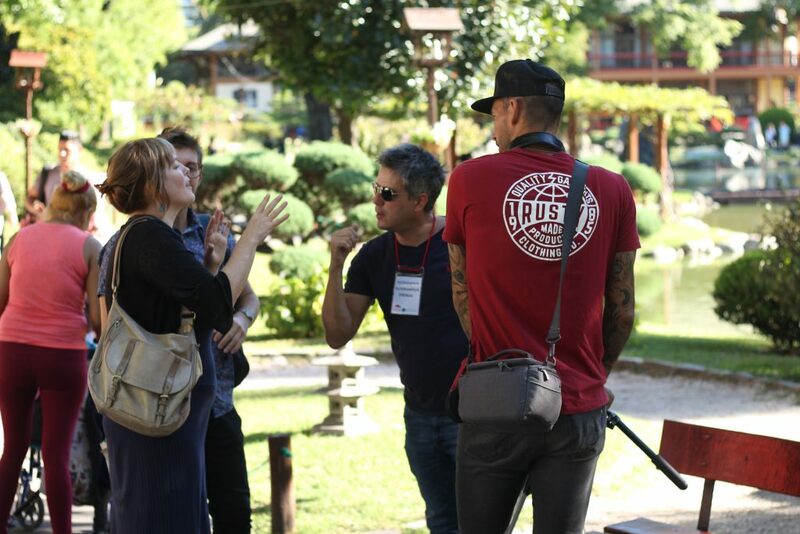 We shot this very entertaining video in the Japanese Garden in Buenos Aires–exactly where I married myself five years ago! This interview was a chance to spread the concept of self-marriage in South America in Spanish on the biggest nightly news show in Argentina TeleNoche. Since then I have gotten lots of media requests from radio stations and newspapers in Argentina. Just as a reminder, self-marriage does not at all imply or require being single. I’ve helped married and single women marry themselves in my coaching practice. Self-marriage is not a rejection of intimate relationship but a foundation for it. As a life coach, I speak with many people about how they talk to themselves. Many of us speak to ourselves harshly on a daily or hourly basis. Marrying yourself is usually the culmination of a lengthy process of introspection of examining how you relate to yourself. The goal of self-marriage is to accept all parts of you and love yourself. After all, you are the only one you’ll be with for an entire lifetime! Being kinder to yourself not only makes you happier and more peaceful, it helps you look at a a loved one, a friend, or even strangers, with a softer, more loving gaze. I see comments on social media arguing, “But constructing a beautiful relationship is so important.” I agree! Sometimes putting out all this stuff about self-marriage scares me because in the Internet age people hear the words at a surface level. I also want a loving committed, interdependent relationship. It’s not a contradiction to commit to yourself and a relationship.That’s the vulnerable part of me that might not get seen in my advocacy for self-marriage or Quirkyalone. If that sounds contradictory, so be it–it’s really not. I want the kind of interdependent relationship makes the two people stronger. That’s the deep side of self-marriage. There’s also a hilarious side because marrying yourself can be pretty fun. With Jason Mayne of TeleNoche I was able to be more myself than I am in most interviews. When I talked about Quirkyalone with Anderson Cooper on CNN the interview felt like a battle. When you go to battle you’re tense. When you’re joking you can be more relaxed. Maybe it’s was Jason’s sympathetic genuine millenial vibe, that we were in a park, or that I was speaking in a foreign language. Anyway, he managed to bring out the best in me. We had so much fun! My father said he had never seen a TV interview like this in the US. For those of you who don’t speak Spanish, my team and I translated the interview. Jason: And this ring, what does it mean? Sasha: Well, it’s a commitment to myself, that I’ve taken that step of marrying myself. Jason narration: There is a movement that grows in the world that is called sologamy or self-marriage, people who marry themselves. And one of the references is now in the city of Buenos Aires. Let’s go talk to her because I want to know what this is about. How is it that you marry yourself, is it a traditional party? No? Well, here we’ll see. Sasha: Hi, how are you? Jason: Very good! I want to see this, what you have here. Is it a commitment ring? Sasha: Oh well, yes, it’s my commitment ring with myself. Jason: What does this ring mean? Sasha: Well, it’s a symbol of the fact that I took this step to marry myself. As a symbol of self-love and self-acceptance. Jason: And how long have you been married? Sasha: It’s been five years. We’ve been together for 5 years! Jason: Where did you get married? Sasha: Here, in the Japanese Garden. Jason: Where are you from? Sasha: I’m from the United States, I fell in love with tango, I moved to Buenos Aires, I decided to marry myself and I did the ceremony here in the Japanese Garden. Jason: And does it have something to do with not expecting the prince and going against all that societal pressure of marriage? Sasha: Yes. I was going to be 40 years old and I had not married a man yet and I wanted to do something for myself, a ritual. About being an adult, being a woman, taking charge of my own happiness. And also my self-acceptance, that’s a very profound thing. Jason: Did you tell your friends, your family that you were going to marry yourself? What did they say to you? Sasha: Well, I told very few people, because I knew that most people would not understand. My mother told me, whatever is good for you is good for me, but I know she thought I was crazy. And that’s OK.
Jason: So it’s about not depending on sharing moments with another person, its about feeling feeling good being yourself? Sasha: Yes, and I also like to be in a couple. Getting married to yourself doesn’t mean that I want to be single, it’s not like that. It’s that I want to take care of my happiness, when I’m single or when I’m with someone. Sasha: For me, what is fundamental is to write the vows. Jason: You wrote the vows? Jason: These are the vows of your self-marriage? Sasha: My self-marriage yes, because I can also marry a man. it’s not exclusive, it’s very polyamorous. Jason: The polyamory, I like it, you already stole the concept. Sasha: Yes, we are in everything. Jason: Okay, for example, what does it say? Sasha: I promise to follow what I love, my passions. I promise to fall in love with others’ imperfections as well as I fall in love with mine, because I’m not perfect. Sasha: I promise to see myself beautiful and accept my sexuality. Jason: After, for example, was there a honeymoon? Sasha: Well, there was a day to celebrate with friends, the honeymoon is still coming. Jason: And marrying oneself is only for women? Sasha: No men can also marry themselves. Making some very important point about self-marriage to the crew! Sasha: In 2004 I wrote this book (Quirkyalone: A Manifesto for Uncompromising Romantics), and this book is the first place where there was published writing about self-marriage in a book. I did interviews with other women who had done it (married themselves) in California. Jason: At what time did you say I want to marry myself? Sasha: That was some months before my 40th birthday, I was very anxious. Jason: How is the wedding ritual? Sasha: Yes, there were many cases when women who wear the white dress and do the whole party. Everything. Jason: You got gifts for self-marriage? Sasha: There were gifts that were very sentimental, but not a lot of money. My self-marriage was very inexpensive, very economical. Jason: Are there companies that offer self-marrying services? Sasha: There are a few. There’s a box you can buy from the internet to help you with your process, and I see it as very economical, compared to the United States. Getting married in the US is very expensive, and we see what happens in many weddings and for me here is something very economical option that will help you a lot. And you’ll never divorce yourself. Jason: So more economical, and you won’t get divorced if you marry yourself! Sasha: Yes! And you’re free to do what you want. Jason: Could it be that this is the key to happiness? Sasha: It could be, yes! Jason: Here we throw the bouquet of flowers to the back. Jason: Yes! I never thought this moment would arrive and it arrived. Sasha: I’m so happy for you. Jason: Now the only thing that is missing is the ring and I’m all good. And the honeymoon. Analyzing the light and where to shoot – these guys were hilarious. The tattoed sound guy thanked me and said my story would help him get his mother off his back because he could tell her he was marrying himself. 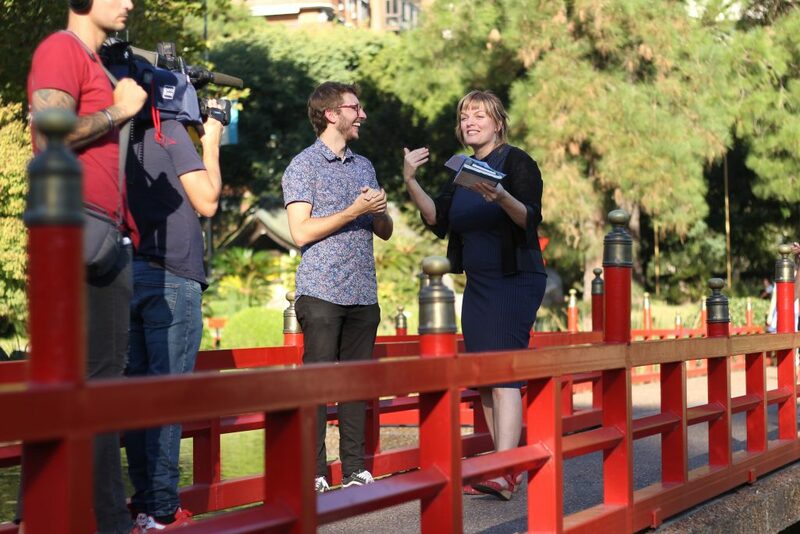 Are you ready to come marry yourself in the Japanese Gardens in Buenos Aires? Or in some other beautiful spot in this city, or in your own city? It’s all possible! I do help women and men, single or already married, marry themselves through my coaching practice so if you want some support to take this step yourself, you know where to go. Check out my coaching page and request a consult. My team and I have also welcomed women to marry themselves or do their own personal honeymoon with a Tango Adventure in Buenos Aires. If that gift to yourself appeals to you, check out the Solo Chica Tango Adventure. With Solo Chica you will not be solo long, just like when you marry yourself you might attract better offers after you take a stand for your own self-worth! Oh Sasha! I loved that. Made me cry. You are amazing! Thank you Paula! I think you’re amazing too! You're almost done. Just head over to your inbox to confirm your subscription to the Sasha Cagen Weeklyish. Alexandra on Is it me or is Christian Carter of “Catch Him and Keep Him” the devil? 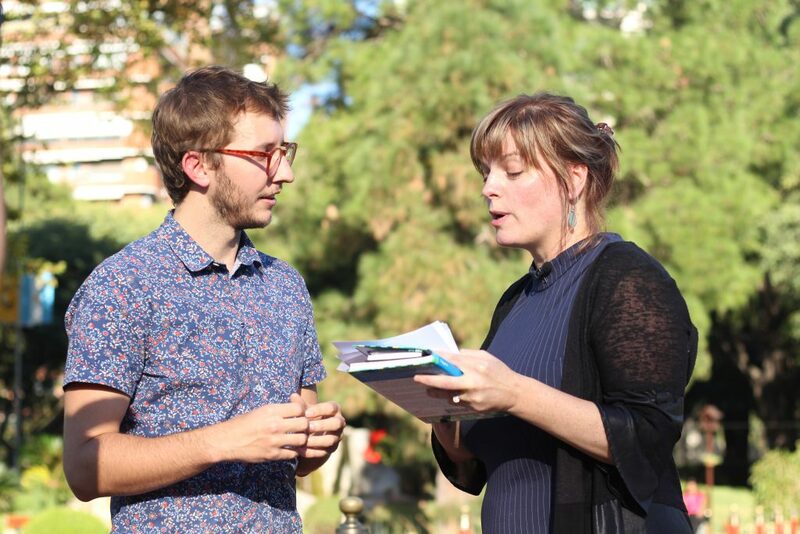 Sasha Cagen on Bringing self-marriage to Argentina! 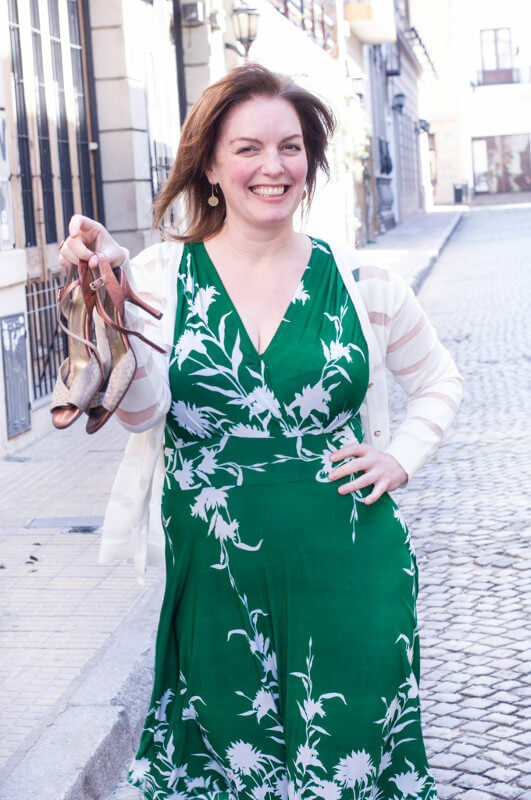 Paula Prober on Bringing self-marriage to Argentina! Sasha Cagen is the author of the cult favorite Quirkyalone: A Manifesto for Uncompromising Romantics and To-Do List: From Buying Milk to Finding a Soul Mate, What Our Lists Reveal About Us. 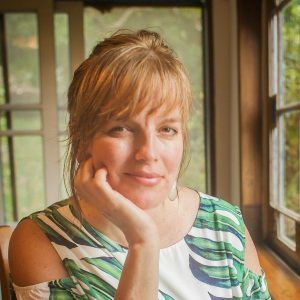 Her work as a writer, life coach and movement-builder has been featured everywhere from NPR and the New York Times to CNN and Vogue. In her well-loved newsletter for those who identify with "quirkyalone," Sasha is the voice for people who don't want to settle--in any area of life. Sasha created Solo Chica Travel to empower women to travel alone and quickly dive in for their own transformative experiences. The first Solo Chica itinerary is the Buenos Aires Tango Adventure. In her coaching practice, Sasha helps smart, successful women (and men) get clear on their goals and achieve them while always helping her clients focus on core issues such as self-worth. Want to stay in touch? Sign up for the Sasha Cagen Weeklyish under the newsletter tab to follow the adventures happening in Sasha's world.